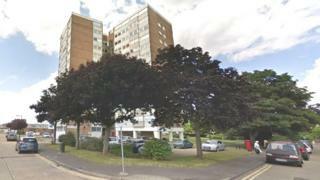 A man arrested on suspicion of attempted murder after a woman fell from a tower block has been released while inquiries continue. The 44-year-old, from Southend, Essex, was taken into custody after the incident, on the fifth floor of a tower block in Jones Close on Thursday. The woman, in her 40s, remains in hospital in a critical but stable condition following the fall, at about 02:00 GMT.